What do you get when you cross a horse with a donkey? It depends! 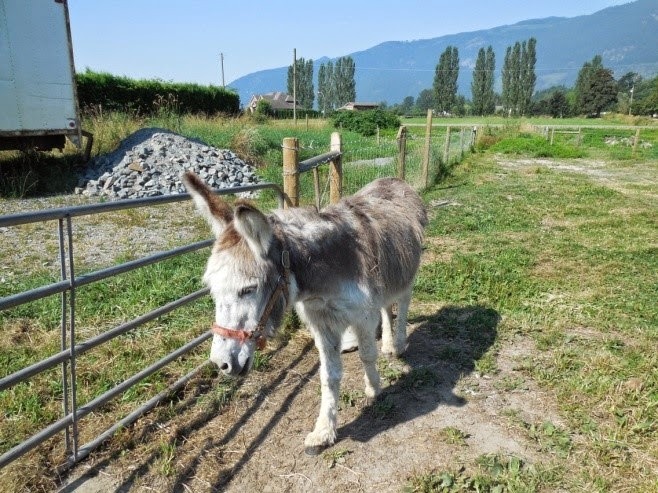 A mule, like this one, results from crossing a horse and a donkey. 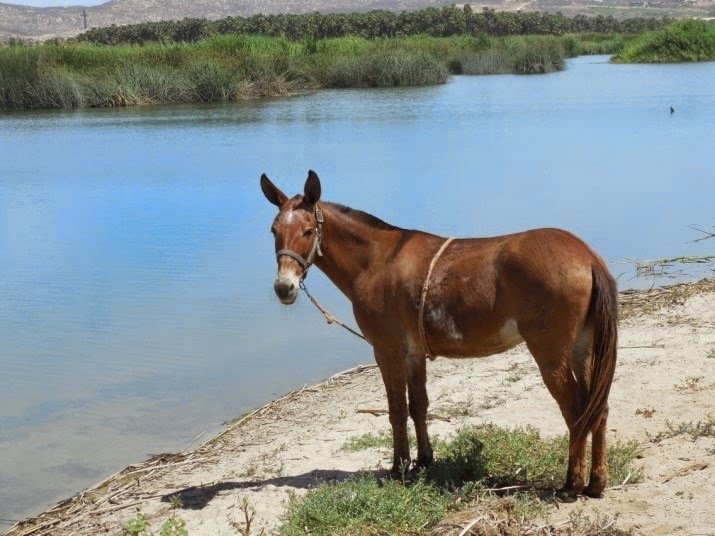 When a male donkey is crossed with a female horse, the resulting offspring is a mule. If a male horse is crossed with a female donkey, then the baby is called a hinny. Hinnies are much less common and tend to be smaller than mules and look more like horses. Horses are half of the equation that makes a mule or a hinny. When two different species of animal, such as horses and donkeys, are bred, the offspring are called hybrids. Both donkeys and hinnies are hybrids. Donkeys have 62 chromosomes in their cells, but horses have 64. Mules and hinnies both have 63 chromosomes, being a blend of both parents. 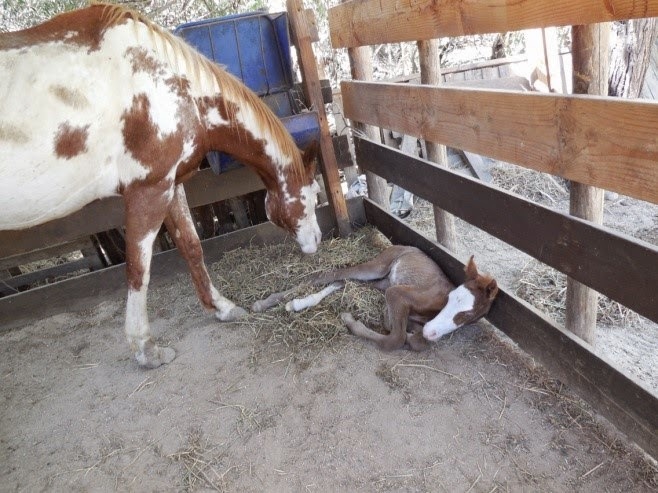 Mules and hinnies can't be successfully bred to other mules and hinnies, but there have been some cases of female mules giving birth to babies sired by horses or by donkeys. The other half of the equation is a donkey, like this one. Mules are usually very smart, strong animals and are used as pets, for transportation, and for farming. They have harder hooves and stronger coats than either of their parents. Mules and hinnies are also generally longer living than their parents and more resistant to diseases. Leslie Johnstone and her writing partner, Shar Levine, are co-authors of dozens of fun practical-science books for kids. Leslie took the photos appearing with this post. History books are still dominated by the doings of a bunch of white men - and the history of science is no exception. 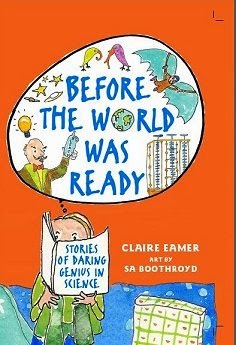 When I was researching my book Before the World Was Ready: Stories of Daring Genius in Science, I wanted to include more variety - women, people of other races, people from other cultures. That, I discovered, is remarkably hard to do. I combed through a lot of books and articles, and I found some names to chase down. However, even with the names, information was often scarce or incomplete or not available in a language I can read. Still – I found some smart and fascinating people, even more than I could fit into the book. Here are a few that made the cut. We usually credit Copernicus with the idea that Earth is not the still centre of the universe, but rather a planet that spins on its axis and revolves around the Sun. But more than a thousand years earlier, in 499 CE, a young Indian mathematician and astronomer, Aryabhata, came to the same conclusion and wrote a book setting out his explanation – all in verse. He was only 23 years old at the time. India’s first satellite, launched in 1975, was named Aryabhata in his honour. 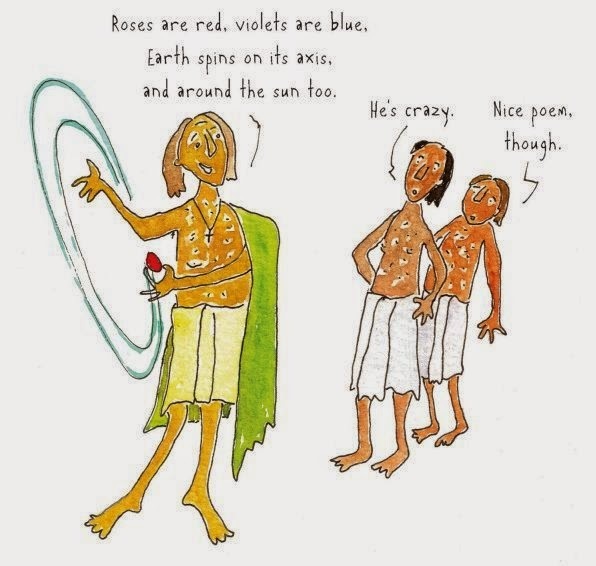 Aryabhata explaining his ideas, as seen by illustrator Sa Boothroyd. Courtesy of Annick Press. Still among the stars, there was Caroline Herschel. Her brother, William, was a famous astronomer in 18th-century England, but Caroline was a pretty decent astronomer herself. A childhood illness left her stunted, barely 1.3 metres tall, but it didn’t stop her. She was an opera singer, kept house for her brother, took notes while he peered through his telescope, did mathematical calculations for him, and – in her spare time – made her own observations. She discovered eight comets and several nebulae, and she was the first woman to be made an honorary member of Britain's Royal Astronomical Society. Several comets, a lunar crater, and an asteroid have been named after her. Mary Anning was an even less likely scientist than Caroline Herschel. She was born in 1799 to a very poor family in an English seaside resort. Mary, her mother, and her brother scoured the eroding cliffs near their home for fossils to sell from a table outside their tiny cottage. At age 12, Mary brought home one of the world’s first fossil ichthyosaurs. Later she discovered a plesiosaur, a pterosaur, and much more. She eventually became as much an expert as the wealthy scientists who bought her fossils, and, after her death, the president of the Geological Society of London delivered a speech in her honour. Mary Anning and her fossil booth, according to illustrator Sa Boothroyd. Courtesy Annick Press. One final example: Al-Jahiz. Al-Jahiz lived about 1,200 years ago in what is now Iraq. He was born poor, probably the descendant of an African slave, but he became a famous writer. One of his most famous works was the Book of Animals. In it, he wrote about food chains, in which smaller animals are eaten by ever-larger animals, all the way from minnows to sharks, and speculated about how the behaviour and even appearance of animals can be affected by their environment – ideas that wouldn’t become major concerns of European science until people like Charles Darwin came along, almost a thousand years later, to talk about evolution. Ok, so I'm crazy about robots. Bug-shaped robots. Bat-shaped robots. Ameba robots. You name it, I love it. So without further ado, here are my top 5 wildest, craziest, coolest robots under development today. You can find even more cool robots in my book Zoobots (Kids Can Press). 5. Origami Robots. These self-folding bots have hinges that change shape when you heat them. I don't even want to know how these might be used. More deets: Science News. 4. Pop'n'Fresh Robots. Easy Bake Ovens could be even more fun if you could slide in your preformed bot and POP! Impress your guests with functioning 3D robots. Shape-changing polymers that morph under heat are the secret of this hot robo-recipe. More deets: Tech Crunch. 3. DNA Machines. Nanorobots based on DNA are inserted into cockroaches, where they can then be programmed to deliver meds and do other nano-tasks. Gross in so many ways, no? More deets: PopSci and New Scientist. 2. TERMES. 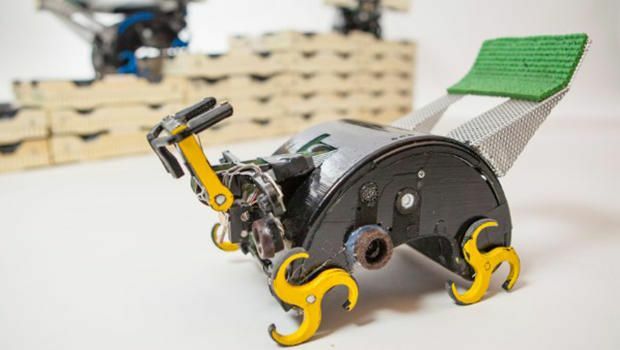 And while we're on the subject of bugs, these termite-inspired robots work together to build all kinds of modular stuff. Preferably not Mies van der Rohe inspired nests in your post-modern home. More deets: CBS News. 1. Knit Your Way to the Future. Saving the best bot for last, Agnes the Knit Bot takes all the grunt work out of making next season's holiday gifts. More deets: Makezine. I was out in the woods a few days ago on a mission—to find enough chanterelles for dinner. My plan was to go in and out as efficiently as possible. No dilly-dallying. No distractions. No paying attention to weird little things. But then I spied a curious little something on a rotting maple log. Closing in on it, I noticed another little something nearby. And then a big something. And then something else. So much for chanterelles for dinner. 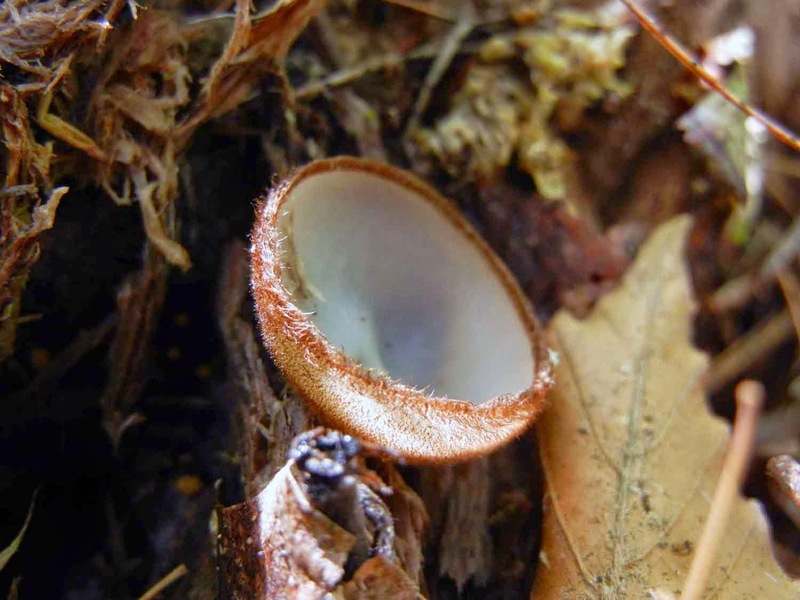 The cup fungus, Humaria hemispherica, is hairy on the outside. gilled mushrooms than to the Humaria cup above. I kept finding things on this log that's been lying on the ground for possibly four or five years. As I continued to add specimens to my basket, I was reminded of an interesting paper that came out of Sweden in 2012. Researchers there had drilled out multiple samples from Norway spruce logs in two separate locations, and at different stages of decay. They carted these sawdust samples off to the lab where DNA was extracted. 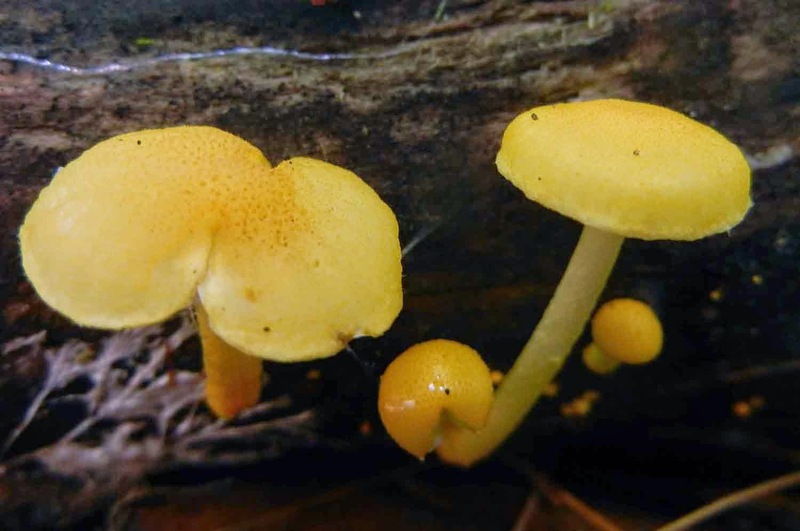 In the 38 logs studied, they found evidence of almost 2,000 species of fungi. One log harboured an astonishing 398 different species! Trichaptum biforme is a common hardwood polypore. wood decomposer, probably contributed to the death of this maple. Inspired, my mission changed from finding food to finding as many species as I could on the log, like a mini mycological bioblitz. Of course I wasn't delusional enough to think I would find anywhere near as many species as the Swedish researchers had in their lab. Unlike the researchers with their DNA sequencing, I was limited to collecting only what I could see with my naked eye—the spore-producing fruiting bodies of wood-inhabiting species. Invisible to me was what was going on inside the log, the strands of mycelia of who-knows-how-many other species that might have produced fruiting bodies earlier in the season, or that might do so later. 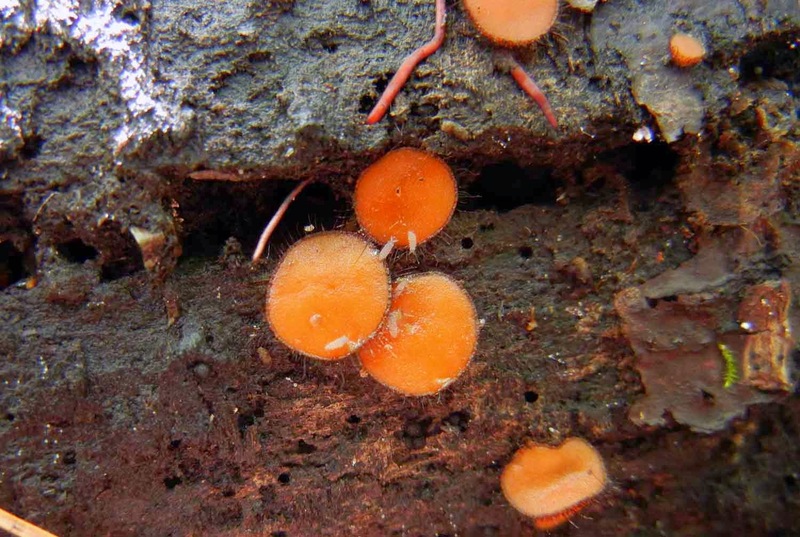 Scutellinia or Eyelash Cups are common orange or red discs with dark-haired edges. 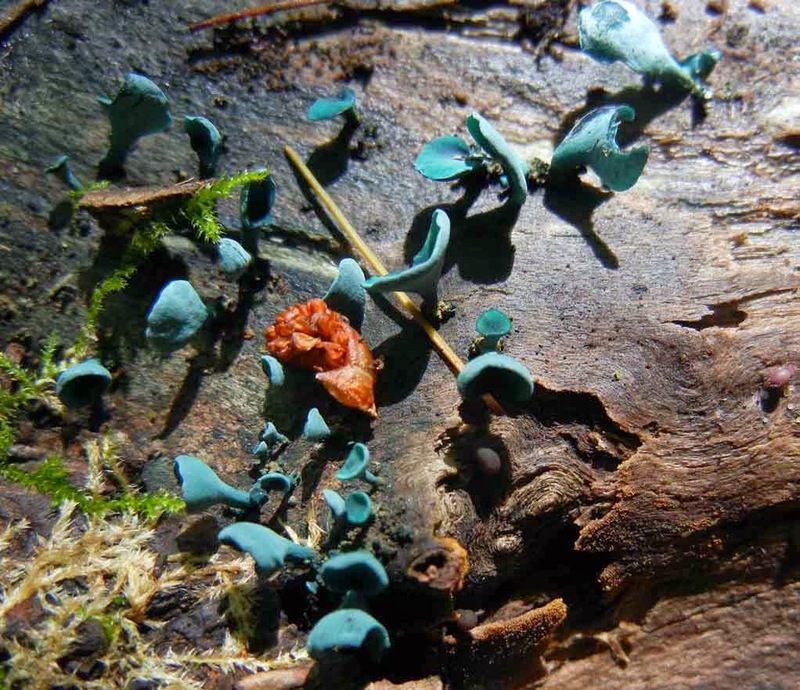 Chlorocyboria species are blue-green and stain wood the same colour. 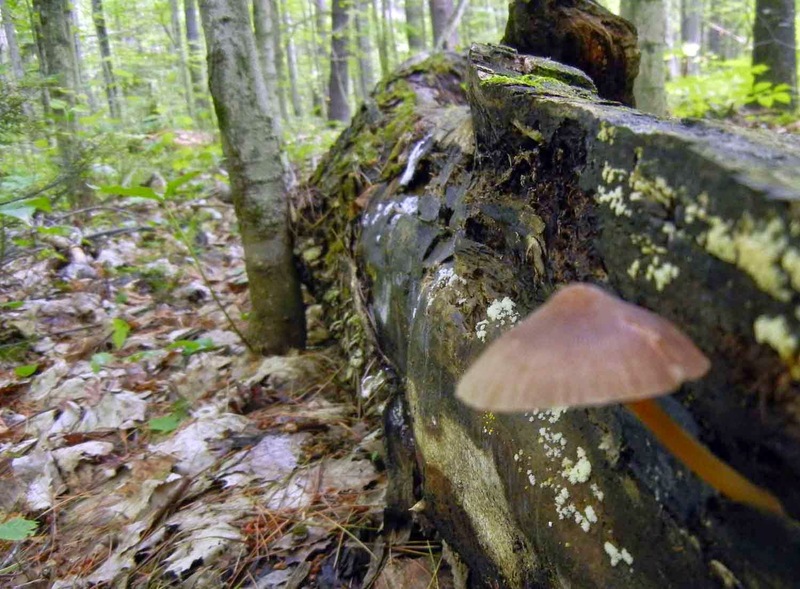 In the life of a rotting log, (which, for a large maple like the one I was exploring, can take twenty years to completely decompose into forest soil), there is a succession of different fungi that do the decomposing. 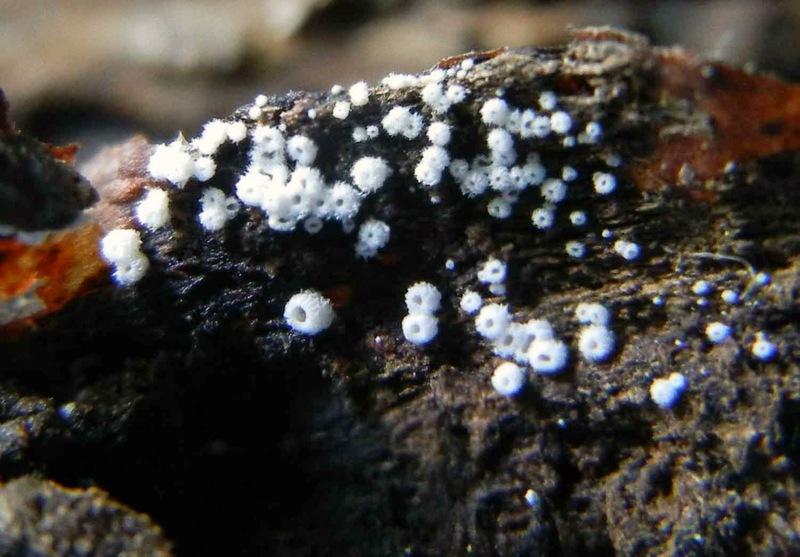 These species arrive as wind- or insect-borne spores, or as already growing mycelia that creep into the log from the forest floor. Some of the earliest colonizers may have caused or contributed to the death of the tree. Some, though not pathogens, may have already spread extensively through the dead wood of the tree before it crashed to the ground. Others don't get a foothold until the log has spent several years absorbing moisture from the forest floor. 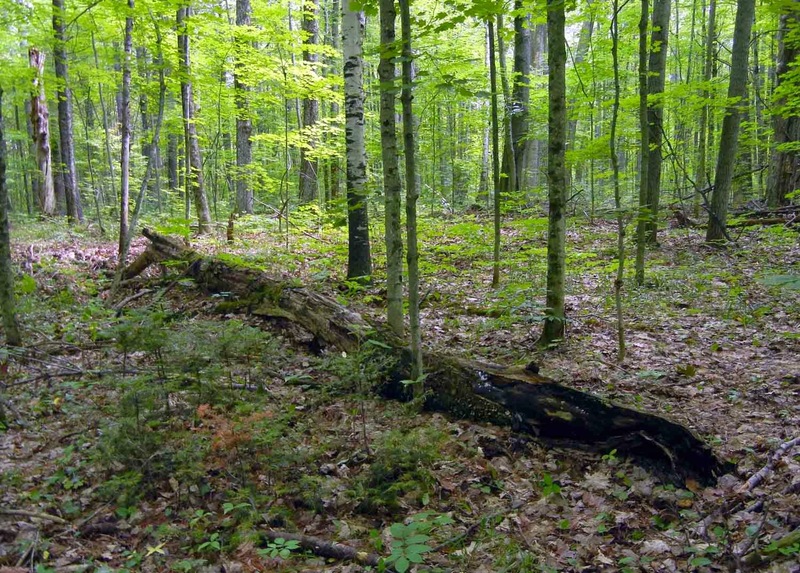 Still others wait until the early decomposers have changed the structure of the wood or its chemical composition. 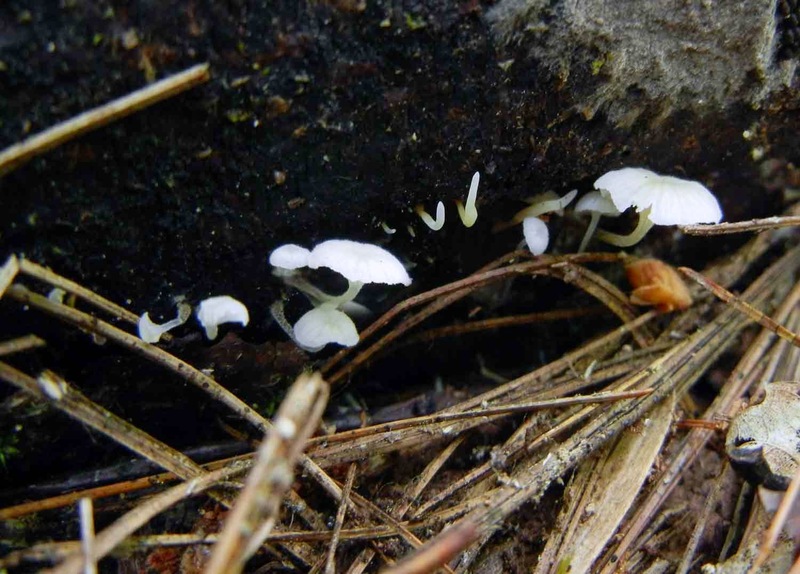 Some, though their mycelia has crept for years through the heartwood, may never actually produce fruit—the mushrooms, crusts, cups, or shelf fungi we can see. These Mycena mushrooms were tiny and fragile. 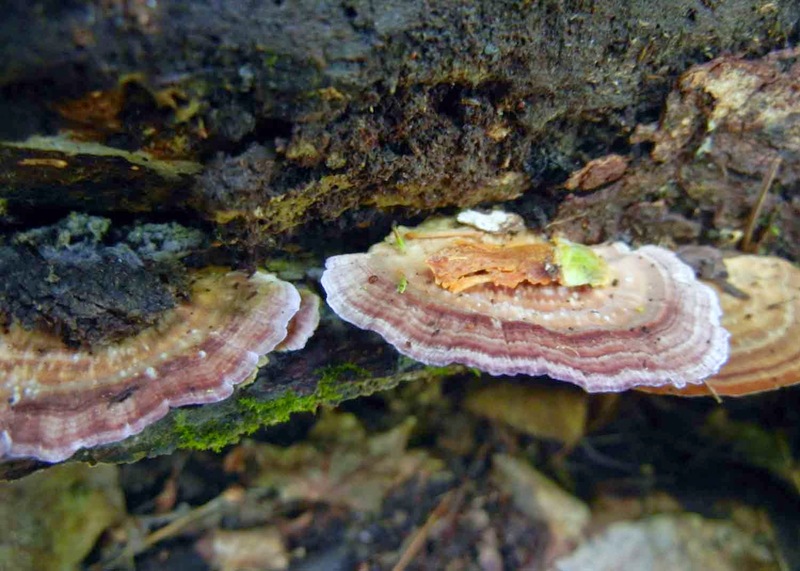 Cyptotrama asprata is a brightly coloured wood decomposer with white gills. I got intimate with this log for an hour, kneeling and squatting, (and swatting away crowds of relentlessly aggressive mosquitoes), while taking pictures and carving off samples. When I was done, I had a basket full of polypores and toothy crusts, cups and saucers, and a few complete mysteries. I even had a nice selection of actual mushrooms with gills. The basket wasn't heavy. Many of the things I found were tiny, as in only a millimetre or two in size. by a parasitic Spinellus fusiger mold. 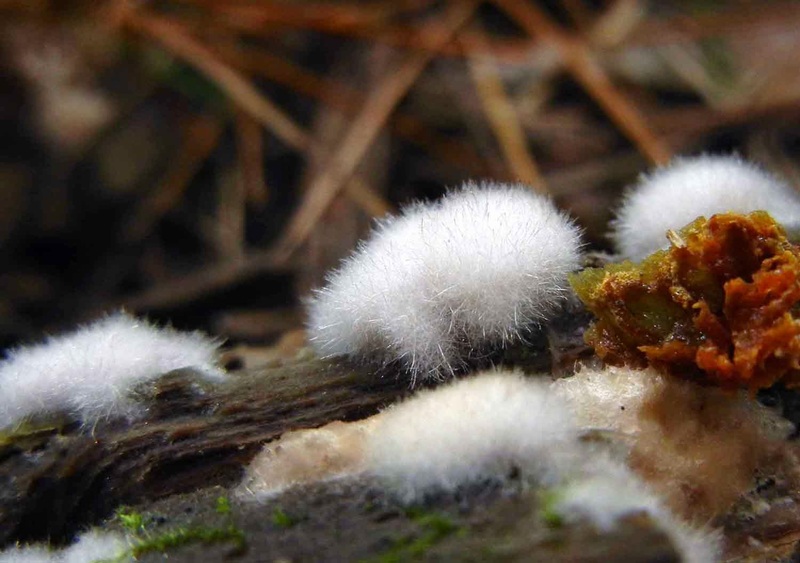 Fuzzy Chromelosporium fulvum is the asexual anamorphic form of a cup fungus. Half of my finds needed microscopy and books and the internet to nail them down to species. I've now spent three days at it and my final number of identified fungi species is 32. 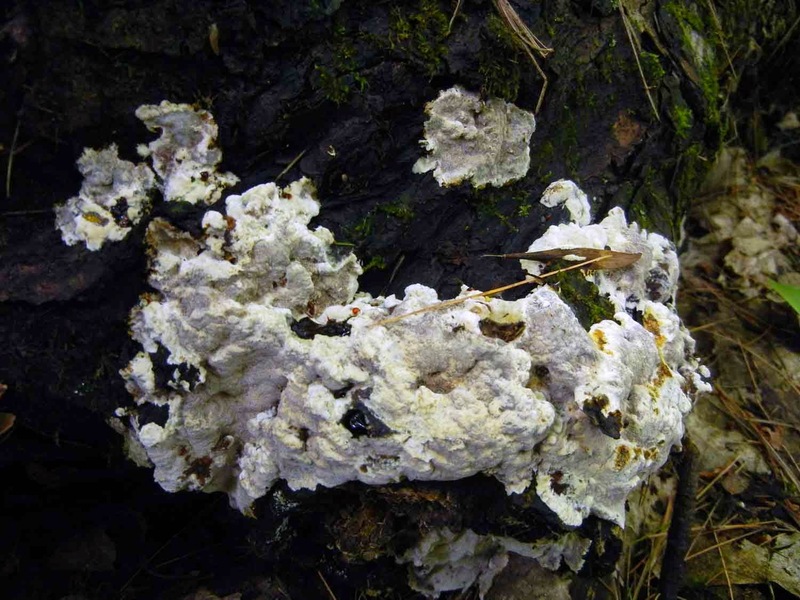 Most are saprophytes, or wood decayers. 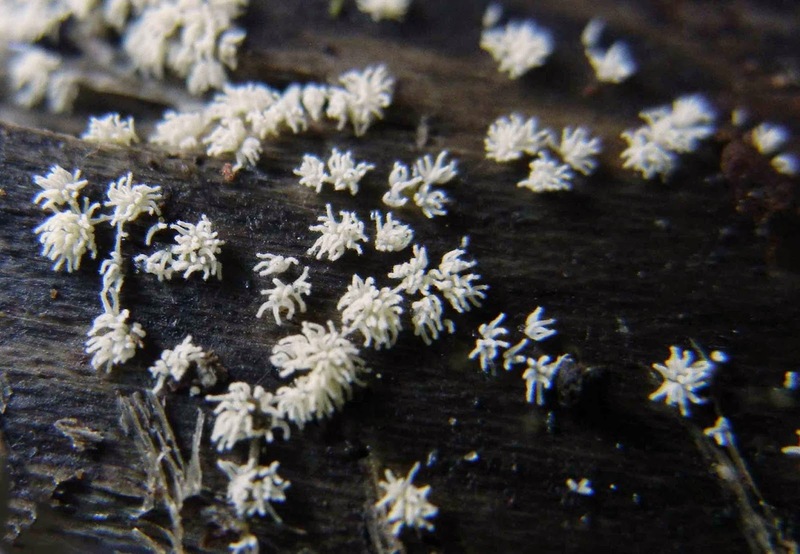 Several are parasites, including a mold that attacks small mushrooms. 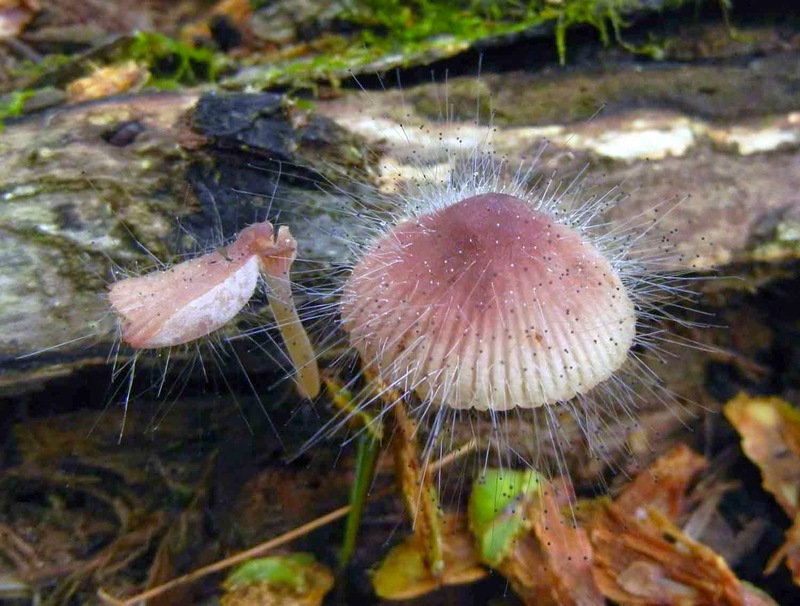 At least one is an anamorph, or asexual form of a completely different looking fungus. I also brought home 7 different myxomycetes, or slime molds, which are unrelated to fungi, but which we fungi fanatics always include in our collections (read about these fascinating guys here)—which brings my grand total to 39 species. Not too shabby! 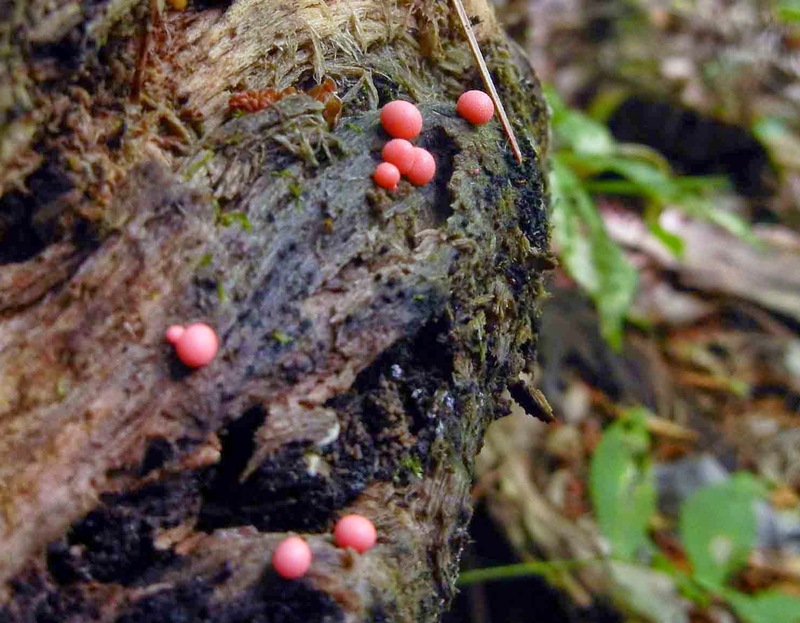 Slime (above) and Ceratiomyxa fruiticulosa, or Coral Slime (below). But now I'm hooked, and I know I'm going to have to regularly visit this log, and keep a running inventory of the progression of species I find on it during its long journey from recently fallen tree to forest soil. It will be a slow project, but it will be fun, exploring the teeming life on this dead tree. 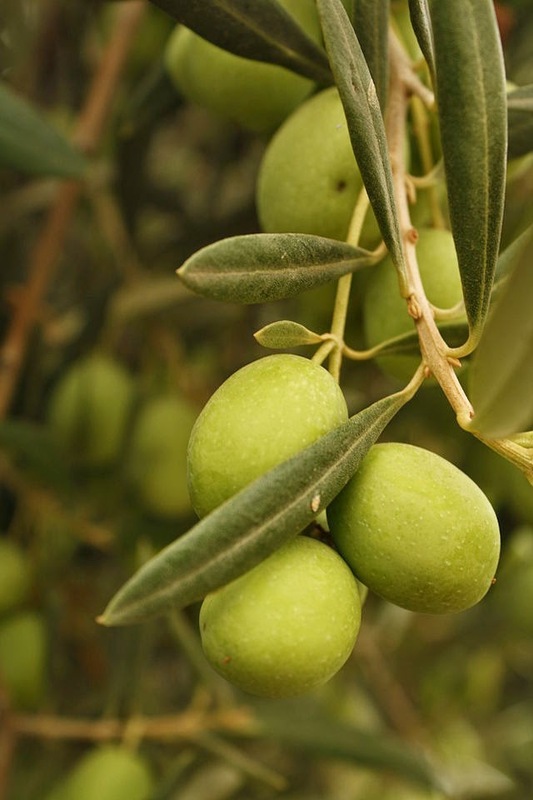 There once was a famous Greek man who owned hundreds and hundreds of olive trees. The oil he made from them had made him quite wealthy, and he possessed anything and everything he could have wanted. His life was filled with joy and contentment. One summer, a terrible drought fell upon the land, and little by little, the moisture fled from the olive trees, hissing out of leaves, twigs, branches, limbs, until every single tree the man owned had withered and died. His money disappeared. His possessions had to be sold for food. And one day, all the man had left was his house, his clothes, and a bowl full of olives. He was distraught with grief, with emptiness, with self-pity. And so, he decided to hurl himself from the cliff at the end of his village, overlooking the sea. He set out for the cliff, popping the last of his olives in his mouth as he went, and throwing their pits over his shoulder. He passed through the village with his face to the ground and after some time reached the cliff’s edge. He looked down at the salty mist curling up from the rocks below and just as he was about to jump into oblivion, he looked over his shoulder. A beggar was approaching him from where he had just come. He was crawling on the ground, picking up the discarded olive pits, sucking on them for any last piece of salt or nutrition. Why did a man who spent most of his time thinking about Cartesian grids and epistemology become so interested in this story? It seems to be simply about a difference in perspective and a difference in appreciation. A rich man loses all he has, and doesn’t realize until the end of his life that what he had was still quite a lot. This story Descartes loved is more than about gratitude and thanksgiving. It’s about people. We are the rich. We are the poor. But we are also the olives. Each and every person we meet will experience us in a different way. Some will take a bite, toss us over the shoulder, to some we’ll do the same. But others will pick up your pit. Your black purple, fleshy, salty, rock hard pit. And they’ll lick it. And they’ll think it tastes wonderful. Oscar Wilde once said, “never love anyone who treats you like you’re ordinary.” I think that we all have a weird, oddly shaped pit. And there are many people out there who will think your’s is beautiful and nourishing. When I was younger, I was convinced the key to a contented life was to not be boring. 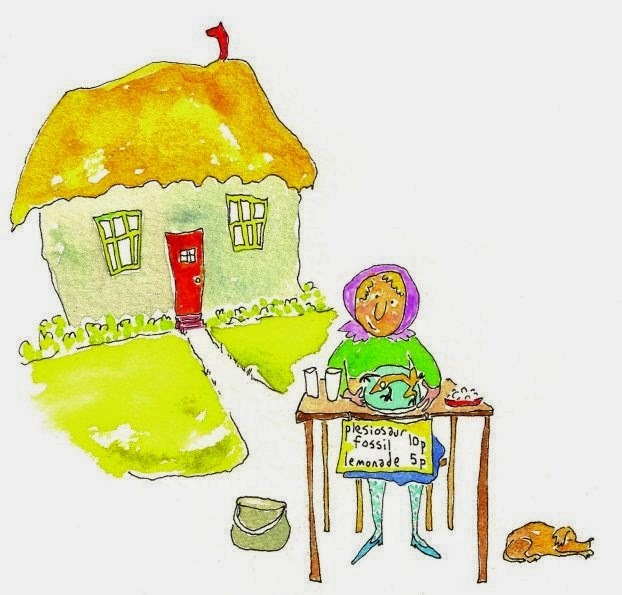 To be creative, and different, and special, and to not just have a little bitty house and a little bitty dog. But the more I thought about it, the more I wondered: what’s wrong with a little bitty life? Whatever sort of life you lead there’s a lot of olives. Things you can have or not have, things you can be interested in or not interested in, people you can love or not love. But the point is that no matter how many olives you lose, no matter how many pits you pick up from the street, whether it’s a person you appreciate, a hobby you get deep into, or a sandwich, you will always have one olive and that’s you. It’s a simple thing, but I think sometimes we get so caught up in being special, maybe even in being happy, that we forget just how lucky we are to have ourselves. I don’t think you need to take your olive to the white cliffs of Dover. I don’t think you need to learn Latin. You don’t need to drink wine and live dangerously. But you have a life. You have an olive, you luck lucky sods. I hope you never get to the point where you become so unappreciative of that little morsel, that you throw the pit over your shoulder. Jacob Wilde is a 17 year old award-winning writer from Eastern Ontario. He is entering his first year at Queen's University to study psychology on a Chancellor's Scholarship.